Ok, I want to upgrade the tx to 10 channels , looked at Github and downloaded the software, tried to view raw data, wouldn't let me, my question is there a work around or other software which hopefully will work? If so point me at it please! The IA6 I believe is a receiver, do you mean you are upgrading an FS-I6 transmitter? 3. Run the EXE file as administrator, no need to view raw data, that I can remember when we upgraded my sons TX. 8. Click on program,when done the TX will reboot. Just found what might be an even more current version. Ok beginning to make some progress, now getting the programmer screen com 3 +open port dims com 3 but does not show firmware version so no progress - suggestions please? 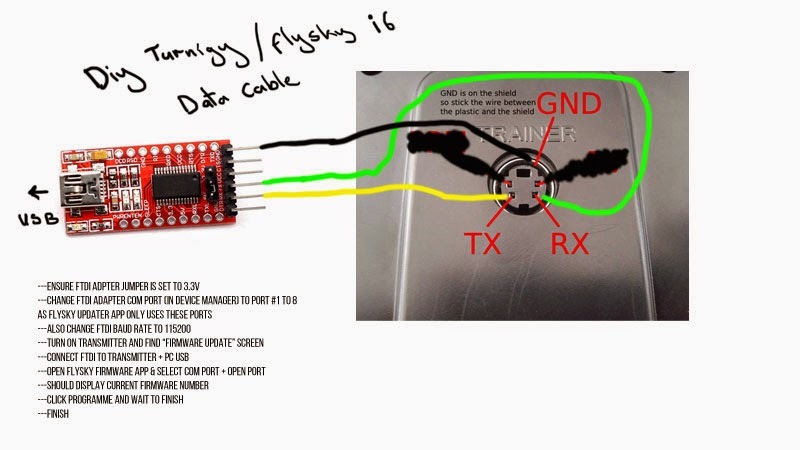 When you plug the USB dongle cord into the TX and then into computer (it must be the specialty cable ordered Or a DIY interface like pic below sometimes works. ), what com port does it use (may have to look in device manager)? Were you all the way in to the update firmware menu? boot software on laptop as admin,plug pable into socket on tx, fire up tx choose firmware update, plug usb into l/top nothing although dev manager indicates the plug etc but no driver installed, where do i find that or is it automatically loaded? i think i'm following the instruction so what am i doing wrong? 1. Can you get into device manager and see if there are any yellow usb icons with the usb cord plugged in? 2. If no yellow driver is loaded, watch as you unplug then plug back in. The "new" device that populates will have the com port. 3. Another option may try changing the com port setting in the programming software. Insteaf of selecting open port change the com port. Click on the down arrow beside com3 and cycle through until the firmware info populates. 1 should the usb dongle have an led light illuminated? If yes, the piece appears to be faulty! 2 In device manager the flashing cable does have a yellow triangle against it indicating device driver reqd -- is this driver in the Github downloads? if so which? I've looked but cannot id it. 3 COM 3 was indicated as I use a USB distribution system, disconnecting it makes no difference, the flashing page still will not read the tx. and then running thro the COM ports 1 - 8 and trying to open again makes no difference! Think now its certain I need the dongle driver! Anyone please! Did you try to open the conflicting (yellow) USB device and attempt update driver? yeap to no avail, will try the link later! Ok, got it after a bit of fiddling -- brilliant many thanks for your assistance!! Another question before I go, my club have a couple of FS-I6's that appear to be 'bricked' ie no response when switched on, can these be unbricked? If so please point me in the correct direction! Ignore my last posting, found the Youtube vid, will give it a whizz tomorrow afternoon at the club!! 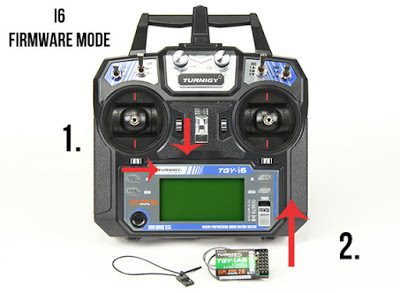 If you push throttle trim down and rudder trim right while powering on, should put it into bootloader mode (possibly nothing on screen) then flash with original firmware, or new firmware. Thanks for that, got 'em -- I'll give 'em a whizz tomorrow at the model boat club, we have some boats belonging to the club which use FS-I6's -- I'm trying to get them ready for the new season of exhibitions where members of the public can have a go so to speak!! Ok the clubs tx's now unbricked and upgraded to 10 channels, hopefully give 'em a longer trial with boats on the water Sunday morning! Being an OLD Fart myself, the research and tinkering that I do keeps me calm and relaxed.